Background Longer schooling is associated with better physical, mental and cognitive functioning, but there is controversy as to whether these associations are causal. We examine the long-term health impact of a policy that increased compulsory schooling by 2 years in France for cohorts born on or after January 1953, offering a natural experiment. Methods Data came from Constances, a randomly selected cohort of the French population assessed for cognition, depressive symptoms and physical functioning at ages 45 and older (n=18 929). We use a Regression Discontinuity Design to estimate the impact of increased schooling duration on health. Cognition was measured based on five validated neuropsychological tests and combined into an overall score. The Center for Epidemiological Studies Depression scale was used to assess depressive symptoms levels. Physical functioning was included as finger tapping, hand grip strength and walking speed. Results The reform increased average schooling, particularly among participants from disadvantaged families. Estimates suggest that for men, this reform improved cognitive scores (β=0.15, 95% CI 0.02 to 0.27), but had no impact on physical functioning. Among women, the reform did not increase cognitive scores or physical functioning but led to higher levels of depressive symptoms (β=1.52, 95% CI 0.32 to 2.72). Results were robust to a range of sensitivity analyses. Conclusion These findings highlight the need to carefully consider the potential limits of policies that increase the length of compulsory schooling as strategies to improve population health. Education is often conceived as one of the social determinants of health amenable to public policy intervention. In Europe and the USA, lower educational attainment is associated with higher rates of mortality1 as well as poorer health.2 If these associations reflect a causal relationship, education policies offer an important avenue of intervention on social determinants, through mechanisms such as improved occupational and income mobility, better health literacy and increased social capital and particularly among individuals from lower socioeconomic position (SEP).1 However, whether policies that increase compulsory schooling improve health is not fully established. To measure the health effects of the reform, we use data from the Constances study, a large prospective community-based cohort study started in 2012.23 Participants were randomly selected to take part in the study and invited to undergo a 1 day clinical examination at 1 of 22 Health Screening Centres run by the National Health Insurance Agency, which covers 85% of the French population. At baseline, a range of comprehensive health assessments were carried out by health professionals, and participants were asked to complete questionnaires about their health, behaviours and socioeconomic circumstances. Our original sample comprised 33 762 individuals aged 45 years and older. We follow previous research19 to choose the bandwidth (number of cohorts born before and after the reform) and focus on respondents born 48 months before or after the cut-off for eligibility to the reform (n=18 928). To document the impact of the reform on school leaving age we use the French Labor Force Survey (LFS), a household survey representative of the French population living in private households. We use data on the age at which respondents left full-time education measured in the 2012 wave. We include respondents born within 48 months of the reform, which includes 72 133 individuals. Cognitive function was assessed by trained neuropsychologists using five tests.26 The Mini-Mental State Examination (MMSE) is a general test of cognitive function consisting of 30 questions assessing five areas of cognition: orientation, registration, attention and calculation, recall and language. The Digit-Symbol Substitution Task of the Wechsler adult intelligence scale IV assesses psychomotor speed. The respondents were presented with nine digit-symbol pairs, followed by a list of numerical digits. They were asked to write the corresponding symbol under each digit as fast as possible. We retain the number of symbols correctly associated in 90 s.27 The Free and Cued Selective Reminding Test (FCSRT) measures verbal episodic memory. Respondents were first asked to read and memorise 16 words, then asked to recall as many words as possible in 2 min. The neuropsychologist provided a cue for each word that has not been retrieved. For this study, we include the FCSRT free immediate recall score. Finally, two verbal fluency tasks were included to assess language abilities: number of words related to the ‘animals’ category named in 1 min for the semantic fluency task and number of words starting with the letter ‘R’ named in 1 min for the phonemic fluency task. As the scale of each individual cognitive test differs, each score is converted to a z-score by subtracting the mean and dividing by the SD. A global cognitive score is obtained by summing the standardised tests. High cognitive performance is defined as the top quartile of the global score’s distribution. Physical functioning is assessed based on three objective health measures. Hand grip strength was assessed using a handheld dynamometer. Participants were asked to sit and squeeze the dynamometer for a few seconds with their dominant hand. The exercise was repeated three times and grip strength was determined as the average of the three results. Finger tapping, a measure of motor performance, was assessed by the number of taps respondents could do with the index finger of their dominant hand for 15 s. Walking speed was measured as the time taken by respondents to walk 3 m at a rapid pace. For each physical health outcome, high levels of physical functioning are defined based on the top quartile of the distribution. Schooling is measured as the age at which respondents left full-time schooling (in the French LFS) and the highest level of education completed (in the Constances data). Educational attainment in Constances is reclassified into four categories: primary education or less, lower secondary education, upper secondary education and tertiary education. Parental SEP during the respondent’s adolescence is based on the French classification of professions and socioprofessional categories. It is recategorised into high (managerial, professional occupations), intermediate (trade and services related occupations) and low parental SEP (manual occupations). We implement a Regression Discontinuity Design (RDD), a quasi-experimental approach used to isolate the causal effect of an exposure using observational data.28 It aims to address unmeasured confounding and reverse causality by exploiting the discontinuity in schooling duration generated by the reform across otherwise similar cohorts. The reform raised the minimum school leaving age for all children born after 1 January 1953 from 14 to 16 years. Our approach classifies respondents born after this cut-off date as the eligible group, while respondents born prior to the cut-off were classified as the ineligible comparison group. RDD compares outcomes between these groups, appropriately accounting for secular trends using local linear regression. where Health ict is a health outcome measure for individual i from birth cohort c at time t; D ic is a binary variable taking the value of 1 if an individual was born after the cut-off date, and of 0 if the individual was born prior to this date; R ic is an individual’s birth cohort relative to 1 January 1953 measured in months, which aims to capture secular trends and X ict is a vector of individual characteristics: age, age squared, gender and month of birth. The coefficient γ1 denotes the health effect of being eligible to the reform. Using local linear regression we model birth cohort effects as a piecewise linear function, with different slopes on each side of the cut-off date. We explore heterogeneous effects by first stratifying our models by gender and parental SEP and then interacting the reform dummy with these variables. Ordinary least squares regressions are used to obtain coefficients and 95% CIs for continuous scores and logistic regressions for OR and 95% CIs for dichotomous outcomes. SEs are clustered at the month of birth level, as recommended when the variable which determines eligibility is discrete.29 To ensure that the functional form is correctly specified, we also estimate models with a cubic term for age. Additional models using triangular kernel weights are estimated to test whether our findings are robust to giving more weights to observations which are closer to the cut-off for eligibility. All analyses were carried out using Stata V.14. Table 1 presents basic characteristics for respondents in our analytical sample (n=18 929). 9635 respondents (mean age=63.68 years) were born up to 48 months before the policy and constitute our ineligible group, while 9293 respondents (mean age=59.72 years) were born up to 48 months after the policy and compose our eligible group. Pre-reform characteristics are similar across the two groups. Additional descriptive statistics are provided in online supplementary appendix table 1. Online supplementary appendix figure 1 shows a strong educational gradient in mental and cognitive health in our sample, with higher educated respondents enjoying higher cognition and lower levels of depressive symptoms. A less pronounced association was found for finger tapping. There is no apparent relationship between educational attainment and grip strength or gait speed in our sample. Figure 1 displays the effect of eligibility to the reform on the proportion of respondents who left school after the age of 16 by gender and birth cohort in the French LFS. There is a clear discontinuity—an increase larger than expected based on the modelled trend—at the time of the reform. Table 2 indicates that the reform increased the time spent at school by 2.76 months for men (95% CI 1.45 to 4.29) and by 2.88 months for women (95% CI 1.40 to 4.36). It was also associated with higher odds of leaving school after the age of 16 for both men and women. Supplementary analyses (online supplementary appendix table 2) show that the effect is concentrated among participants from disadvantaged backgrounds (p value for interaction term <0.001). Effect of eligibility to the 1959 Berthoin reform on the proportion of respondents who left school after 16 by gender in the 2012 French Labor Force Survey (n=72 133), Birth cohorts 1946-1959. The dots and triangles show the average school leaving age, respectively, for men and women and for each birth cohort. The dashed line represents the cut-off for eligibility to the reform (1 January 1953). The fitted lines represent the linear trends for our analytical sample: respondents born up to 48 months before or after the reform, separately for men (black lines) and women (dotted lines). The grey fitted lines show the predicted school leaving age in the absence of the reform. Figure 2 presents the effect of eligibility to the reform on each health outcome by gender and birth cohort. There is an apparent discontinuity in cognitive scores for men and depressive symptoms for women for the 1953 cohort, suggesting that the reform may have increased cognition in men but also depressive symptoms scores among women. Table 3 presents local regression estimates of the effect of the reform on health. Males required to stay at school longer had higher cognitive scores (β=0.15, 95% CI 0.06 to 0.24) and higher odds of being in the top quartile of cognitive performance (OR=1.81, 95% CI 1.26 to 2.66) compared with those who were permitted to leave school at age 14. Results by individual cognitive score (online supplementary appendix table 3) show that this effect was driven by higher scores on the MMSE and memory test. Eligibility to the reform had no effect on depressive scores or physical functioning among men. 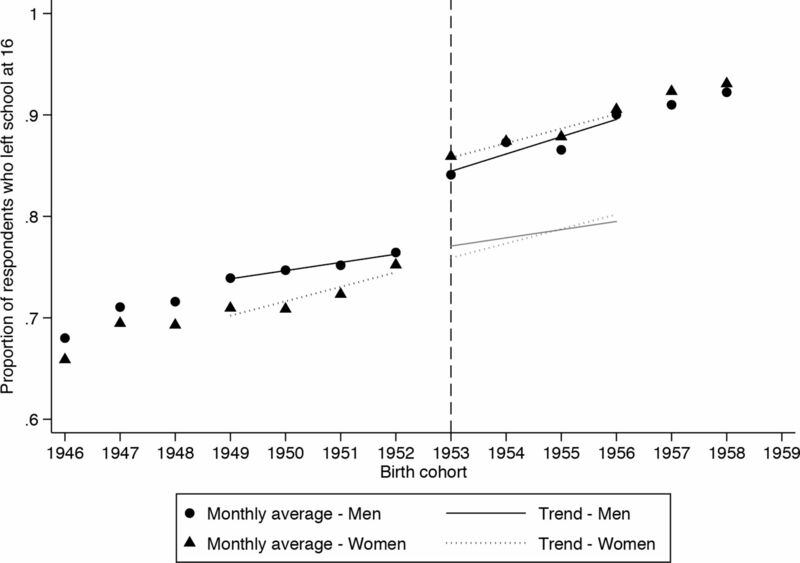 Effect of eligibility to the 1959 Berthoin reform on health outcomes by gender in the 2012 Constances Study (n=33 762), Birth Cohorts 1946–1959. The dots and triangles show the average school leaving age, respectively, for men and women and for each birth cohort. The dashed line represents the cut-off for eligibility to the reform (1 January 1953). The fitted lines represent the linear trends for our analytical sample: respondents born up to 48 months before or after the reform, separately for men (black lines) and women (dotted lines). 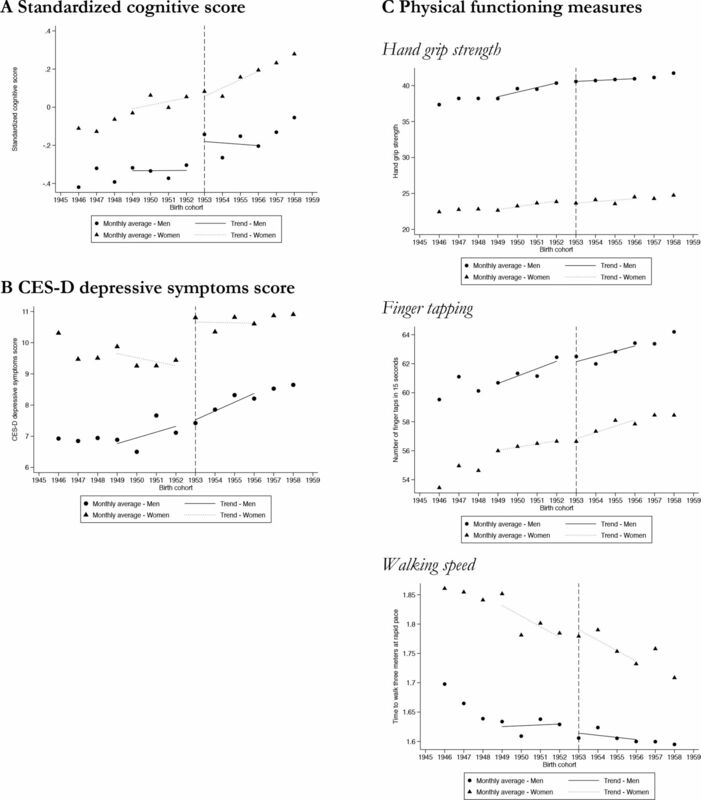 CES-D, Center for Epidemiologic Studies Depressive Symptoms Scale. Among women, there are no significant effects of eligibility on cognition overall or on specific cognitive tests (online supplementary appendix table 3). The p value for the interaction term between eligibility to the policy and gender is significant (p=0.03, online supplementary appendix table 4). However, women eligible to the reform scored 1.52 points (95% CI 0.33 to 2.71) higher on the CES-D depression scale and had higher odds of elevated depressive symptoms (OR=1.27, 95% CI 1.05 to 1.54). We find no effect of the reform on women’s physical functioning. Supplementary analyses stratified by parental SEP (online supplementary appendix table 5) indicate that these effects are concentrated among respondents from disadvantaged families although the interaction term between eligibility to the reform and low parental SEP is not significant either for cognition (p=0.12) or depressive symptoms (p=0.18, online supplementary appendix table 4). Additional analyses on intermediate socioeconomic outcomes indicate that the reform did not translate into higher qualifications or wages for either gender but was associated with higher odds of being in employment in 2012 among men (online supplementary appendix table 6). The reform was also not associated among women with marital status or number of children (online supplementary appendix table 7). We conducted several sensitivity analyses to check the robustness of our findings.30 First, our results on cognition and depressive symptoms are robust to the inclusion of a cubic term for age (online supplementary appendix table 8) and to an alternative estimation with triangular kernel weights (online supplementary appendix table 9). Second, to confirm that our estimates are driven by the reform and not by secular trends, we estimate the effect of ‘placebo reforms’ for years in which the reform did not take place (online supplementary appendix figure 2). Analyses revealed no evidence of other discontinuities for cognition among men and for depressive symptoms among women. Third, we experiment with different bandwidths, ranging from 12 to 72 months. Results presented in online supplementary appendix figure 3 indicate that our estimates are also robust to different bandwidth sizes. We leverage the discontinuity in schooling duration induced by a major French reform to estimate the long-term effects of schooling on adult health. Our results offer a complex picture: while men who stayed longer in school as a result of the reform had better cognitive function in older age, women eligible to reform did not show gains in cognitive function and instead displayed higher levels of depressive symptoms in midlife. There are several possible explanations for these results. Education is hypothesised to influence health partly by enhancing access to health-promoting resources such as health literacy, self-efficacy, social networks and better jobs and earnings.1 Available evidence suggests that the French reform—contrary to other schooling laws in the USA and Western Europe—did not lead to substantive improvements in qualifications or earnings.36 Our analyses partly confirm this pattern: longer schooling did not translate into higher qualifications or wages for either gender but was associated with higher odds of being in employment in 2012 among men. For women, the additional years of schooling were not associated with an upgrading of their position in the labour market, potentially creating a job-education mismatch detrimental for mental health.37 The discrepancy between the expectations created by the reform and the actual long-term benefits might have been particularly harmful for women’s mental health as research suggests that women have smaller economic returns on education.38 A second hypothesis is that the health effects of education for women operated partly through the marriage market and not exclusively through employment and wages.22 39 However, the reform did not exert any effects through this pathway as eligibility was not associated with women’s marital status or number of children. Consistent with our findings for physical functioning, previous studies have reported weak or inconsistent effects of schooling laws on physical health.40 There are three possible interpretations. First, we may not have enough power to detect the effect of the reform on physical health: the CIs for these estimates are wide and include substantial benefits as well as harms as plausible effects. Second, our sample was relatively young and these measures may not discriminate subtle differences in physical functioning in younger age. A third possible interpretation is that the commonly observed association between education and functioning may be partly driven by selection. A potential implication would be that increasing compulsory schooling may not be an effective policy to improve physical health. A recent theoretical framework linking human capital, schooling and health identified skills formation as a critical pathway.22 Our results indicate that degree attainment and skill formation—which were not impacted by the Berthoin reform—might be more important for health than the amount of time spent in school. Major strengths of our study include the use of a quasi-experimental design in a large population-based cohort, as well as an extensive battery of objective health measures. RDD is a powerful tool to estimate causal effects of policies for which eligibility is based on a clearly defined threshold or time point.28 A limitation is that our data are cross-sectional, so we were unable to examine longitudinal trajectories. Reverse causality, however, is not a concern in our study because the reform affected cohorts decades before health measures were taken. In addition, if exposure to the policy is ‘as good as’ random, using cross-sectional data should not compromise estimates of the impact of the policy on health outcomes in later life. Taken together, our findings provide a mixed picture of the long-term health effects of a policy that increased compulsory schooling. Decades after implementation, the Berthoin reform led to better cognitive outcomes among men, but also to increased rates of depressive symptoms among women. The reform had no measurable impact on physical functioning. Our results do not suggest that education is not beneficial for health but indicate that policies focused on increasing the quantity of schooling and not its quality, for example, might not be the best tool to improve population health. Education is a social determinant of health particularly amenable to public policy reforms. Observational studies have suggested that higher education is associated with better health but whether policies that increase schooling duration can also improve health is unclear. Our findings provide new quasi-experimental evidence on the long-term effects of compulsory schooling on a range of adult clinical outcomes. An increase in compulsory schooling was associated with large increases in cognition among men and also with increased depressive symptoms among women. These results highlight the need to consider the potential trade-offs of schooling laws as tools to improve population health. The authors are very grateful to Celine Ribet for her help with data access and management. The authors thank the ‘Caisse Nationale d’Assurance Maladie des Travailleurs Salaries’ (CNAMTS) and the ‘Centres d’Examen de Sante’ of the French Social Security which are collecting a large part of the data as well as the ‘Caisse Nationale d’Assurance Vieillesse’, CinSearch, Asqualab and Eurocell in charge of data quality control.
. In: Berkman LF , Kawachi I , Glymour M , eds. Socioeconomic status and health, in social epidemiology. 2nd edn. New York: Oxford University Press, 2014:17–62.
. The effect of education on old age cognitive abilities. Econ. J 2012;122:418–48.
. The effect of education on health and mortality: a review of experimental and quasi-experimental evidence. Boston, MA: National Bureau of Economic Research, 2018.
. The CES-D scale. a self-report depression scale for research in the general population. Appl. Psychol. Meas 1977;1:385–401.
. Adult intelligence scale-revised. New York: Psychological Corporation, 1981.
. Does more education always improve mental health? Evidence from a British compulsory schooling reform. York: University of York, HEDG Working Paper series, 2017. Contributors EC conceptualised and designed the study, carried out the analyses and drafted the manuscript. VN contributed to the design and analyses, reviewed and revised the manuscript. MA, MMG, MG , CB, LFB and MZ critically reviewed the results of the analyses and reviewed and revised the manuscript. EC is guarantor. Funding The Constances Cohort Study was supported and funded by the Caisse Nationale d’Assurance Maladie des Travailleurs salaries (CNAMTS). The Constances Cohort Study is an ‘Infrastructure Nationale en Biologie et Sante’ and benefits from a grant from ANR (ANR-11-INBS-0002). Constances is also partly funded by MSD, AstraZeneca and Lundbeck. This work was supported by the European Union’s Horizon 2020 Research and Innovation Programme (Lifepath—grant number 633666). EC and MA are also supported by the Horizon2020 Mindmap project (667661). MA is supported by a National Institute on Aging grant (R01AG040248). VN acknowledges financial support from the Economic and Social Research Council (ESRC-KISS DTC). Disclaimer The study does not necessarily reflect the commission’s views and in no way anticipates the Commission’s future policy in the area. The funding source did not have a role in the design and conduct of the study, the collection, management, analysis and interpretation of the data or the preparation, approval or decision to submit the manuscript. Ethics approval The Constances cohort received ethical approval from the French National Data Protection Authority (authorisation no. 910486) and the Institutional Review Board of the National Institute for Medical Research (authorisation no. 01-011). No further ethical approval was sought for this study. All participants gave informed consent to participate. Data sharing statement The Constances cohort is available for registered users and on approval of a research project by the scientific board at http://www.constances.fr/index_EN.php.